I made these 3 Ceramic porcelain magnets with Cat features for us cat lovers! One has a sitting cat figure, glazed in Celadon Green, Kitty footprints in Orange, & a Fish Bone design with MEOW in Sage Green. Tin is magnetic & handy to hold safety pins, bobby pins, paper clips, etc. 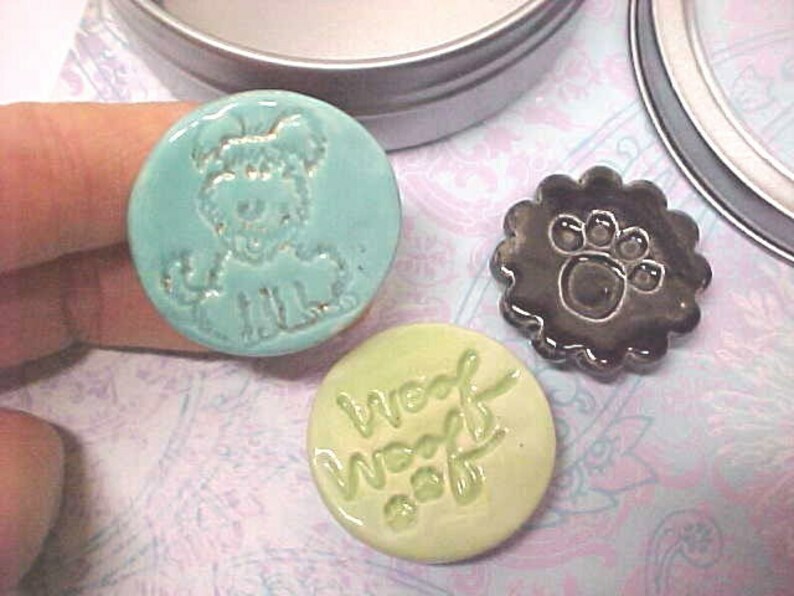 Or choose DOG magnets as shown, a Shaggy Dog, Dog Paw prints and a Woof Woof magnet. Ready to mail when you purchase to enjoy on your fridge, file cabinet, message board, etc. Also make great locker magnets! See more unusual pottery in my Etsy shop!